Security for annotations may be set generally (i.e., to apply to all annotations). E-DataAid does not support the setting of security options for individual annotations. If an Administrator is preventing Users from viewing a variable or its data, it may be prudent to also restrict the User from viewing any system or user-created annotations (i.e., the annotations may contain references to the hidden data). By default, Users may add their own annotations to a data file using the Create New button on the Annotations dialog (see E-DATAAID: Annotations (E-DataAid) . The Annotations dialog may be displayed using the Display Annotations command in the View menu. The creation of user annotations may be restricted by an Administrator. 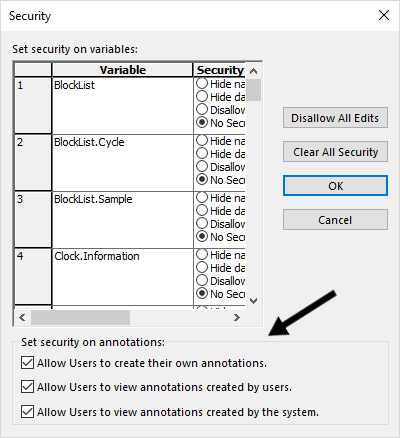 If the option to allow users to create annotations is unchecked in the annotations security settings, a User (i.e., using the Open command to open a file) may not create new annotations or add text to an existing annotation. If this option is unchecked, system annotations are still automatically created for all file modifications. Security options for allowing the creation of User annotations may be set by an Administrator using the File Security command in the File menu. User annotations are created by displaying the Annotations dialog via the Display Annotations command in the View menu, and choosing the Create New button on the Annotations dialog. By default, Users may view all user annotations. The viewing of annotations may be restricted by an Administrator. If the option to allow the viewing of annotations created by users is unchecked in the annotations security settings, a User (i.e., using the Open command to open a file) may not view user-created annotations. Security options for viewing user annotations may be set by an Administrator using the File Security command in the File menu. By default, Users may view all annotations created by the system. System annotations are the annotations the application automatically logs for all edits. The viewing of annotations may be restricted by an Administrator. If the option to allow Users to view annotations created by the system is unchecked in the annotations security settings, Users (i.e., using the Open command to open a file) may not view system annotations. Security options for viewing system annotations can be set by an Administrator using the File Security command in the File menu.